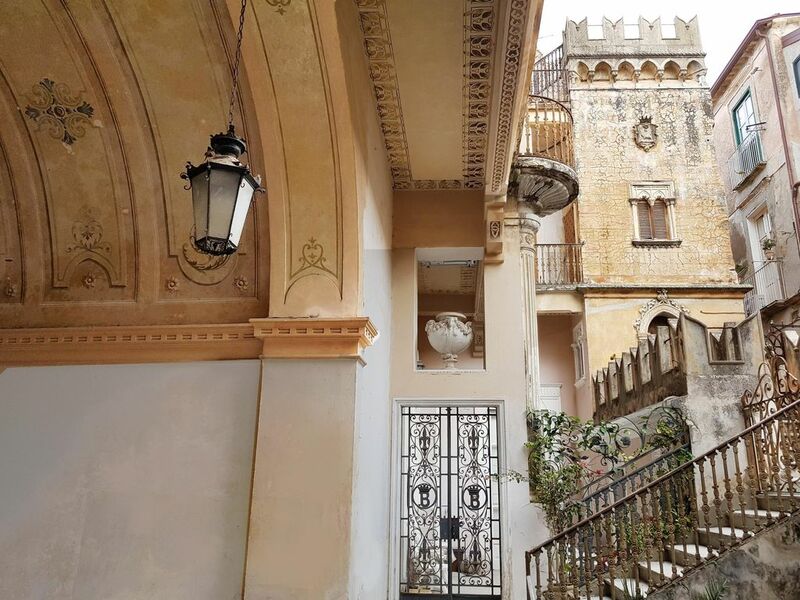 The apartment Martina is situated on the first floor of Palazzo Bragho, an ancient and noble "Palazzo" built in 1721, in the heart of Tropea town centre, 5 minutes walk to the sandy beach ( we also provide the beach umbrella to take to the public beach). The apartment is very fresh, equipped with free broadband wi-fi, terrace in Arabian Style, one first entrance room where there are: digital/sat tv (free Netflix), table with chairs + 2 single beds. A second 40 square metres room provided with balcony which faces on Piazza Galluppi and window which faces on via Pontorieri + confortable sleeping loft. Downstairs, there is on the right side a fully equipped kitchen with fridge, gas oven, and toaster + indipendent bathroom with cabin shower, bidet and hairdryer, On the left side there is a sofa bed for 2 guests + bedside table and wardrobe. Upstairs, there is a wooden mezzanine with one double bed and 1 single bed + wardrobe. (There is also a common washing machine situated in the storage). If you come by car, we suggest where to park, because the town centre is closed to all the vehicles of non residential people, the parking lot is free and 10 minutes walk to your accommodation). Check in: 14.30 - check out: 10.00, if your train or plane leave after 10.00, you can leave your luggage here and take it before your train or plane departure. Upon arrival we provide our guests with the town centre map (including information of the streets, shops, restaurants, tour agencies, and more, we also add the discount card which can be used for special discounts on the price list at local restaurants, pizzerias, bars, daily boat trips leaving from Tropea port to Stromboli and the Aeolian islands. bathroom with cabin shower and hairdryer. free fast internet connection wi-fi and plug to connect your laptop. Beautiful building,central to town and five minutes from the beach,perfect! It was nice to meet such a lovely family who enjoyed the apartment and Tropea, we look forward to their return next year, as they will always be very welcome. We had a fab time in Tropea in this lovely apartment. Pasquale met us in the centre and walked us round to the apartment where we were introduced to the turtle (which our daughter loved!). He had laid on bottles of water and basket of fruit which was most welcoming. Pasquale lives in the adjacent apartment so was on hand if needed (i.e. for beach towels when we couldn't find them). He was very amenable but didn't crowd us so it didn't feel intrusive. A map was provided on arrival and a discount card for several restaurants in the area. Although not one covered by the discount card, we can highly recommend the Il Convivio which was in the alley way opposite the "other entrance" to the building. (The other entrance is blocked because it is a tourist attraction and many people have their photo taken by it. ) If you go to Il Convivio you have to try the steak in four cheese sauce - there isn't anwhere that you will get a better steak - it was seriously good. Most of the restaurants specialise in seafood but be careful what you ask for - do you research first or you could end up with a fish that you don't know how (or which bits) to eat! There are loads of steps (approx 160) to get down to the beach which was very busy but worth the effort for the beautiful crystal clear sea. The views were amazing. Pasquale provided a beach umbrella which came in useful, although the cost of umbrella and chairs on the private beaches wasn't too extortionate. One thing to mention if you have a young family is that there is a nighclub a few doors away that plays music well into the early hours (3am on most nights). However, this didn't bother us too much as the sea air meant we fell asleep relatively quickly! We highly recommend both Tropea and the Martina apartment. Thank you Pasquale, we're very glad we booked this trip. Very nice family, easy to accomodate, very quite, the cleaning lady told me they left the apartment in perfect condition, I am sorry for the August night movida, ( only in the month of August the Mayor allowed to play music in the night). I will be very happy and will be a pleasure for me to welcome them in the future. Pasquale owns several apartments in Palazzo Bragho, we rented apartment Martina for nine days. There was plenty of space for my husband and our two adult kids and myself to spread out in the two enormous rooms, one with a balcony, plus kitchen, bathroom and courtyard garden off the sitting room. The apartment had high ceilings, and interesting architecture inside and out. Massive wooden doors lead into the high walled palazzo, making it very secure and private. Pasquale the owner was very helpful and caring, picking us up from the airport and phoning to check we were ok during our stay, nothing was too much trouble for him. He speaks excellent English, I wish my Italian was as good. He gave us a discount card for some excellent local reataurants and cafes, one of which was situated in the old wine cellar below the palazzo. The kitchen was well equipped to cook, but the food was so reasonable to eat out and so delicious, that we did not eat in very often. The apartment is one of several owned by Pasquale in the palazzo, therefore if a few families were travelling together it would be good to rent more than one, as there is good outside space and large enough rooms to get together for meals etc whilst retaining some privacy at other times. The apartment was excellent value. The setting in the town made it easy to get to shops, restaurants, the weekly markets etc wear comfortable shoes as most of the streets are cobbled. To get down to the beach there are quite a few steps, although I believe they are in the process of building a lift. The upside of having to descend to the beaches are that the views out from the small streets within easy walking distance of the apartment are breathtaking. The people we met who owned and worked in the gelaterias, cafes, shops and restaurants in Tropea were so warm and welcoming whether or not you were buying. There is lots to see and do both in Tropea and close by. There are lots of beaches to choose from which in May we had to ourselves. Many are within walking distance, but there is a train station in Tropea if you don't want to rent a car. There are trips to Stroboli and the other islands by boat, but try to go when the sea is calm, we didn't ! We would definitely stay in this apartment again and would love to revisit Tropea. "As a family of four the apartment and its location were perfect for us. Spacious, clean and having all we needed for our stay. Pasquale was the ideal host and it was a pleasure to meet him and his family - and the turtles. We would not hesitate to recommend this apartment to anyone who wants a break in our favourite place in Italy." "We had a dream holiday in Tropea. The palazzo (Martina apartment) was spacious, comfortable, very well placed in the centro storico, and with a charming period atmosphere, all the more evocative for not being too spruced up. The courtyard was perfect for eating out and relaxing. As a landlord, Pasquale was warm, welcoming, efficient and generous with information about the town and its history. We would certainly return." "We had a fantastic stay at the Pantomar. The apartment was huge, and had everything we needed for our week's stay (cooking facilities, internet, clothesline, etc). The historic palazzo was very impressive, and situated near restaurants, shops, and the steps to the beach, but was still in a nice quiet area. Pasquale was the perfect host, and went out of his way to acquaint us with the town, area and local people, which really added to our appreciation of Tropea. We will definitely be back "
By car: take the A3 highway (Salerno-Reggio Calabria), exit at Pizzo C. and follow the directions to Tropea. Enter Tropea through TROPEA CENTRO ( NOT TROPEA CENTRO/LUNGOMARE PORTO). After entering Tropea centro, drive down for 100 metres, turn left and go on for 100 meters then turn right, pass down a small bridge and go straight down along viale Stazione, you can park for free on the left side ( no lines or white lines) close to Eni gas station, then 10 minutes walk to your accommodation. By train: Tropea train station then 10 min walk to the accommodation. By plane: Lamezia Terme international airport and then only 50 minutes trip by local train to Tropea. (Transport by taxi upon demand). By plane: Reggio Calabria international airport and then 2 hours trip by train to Tropea.